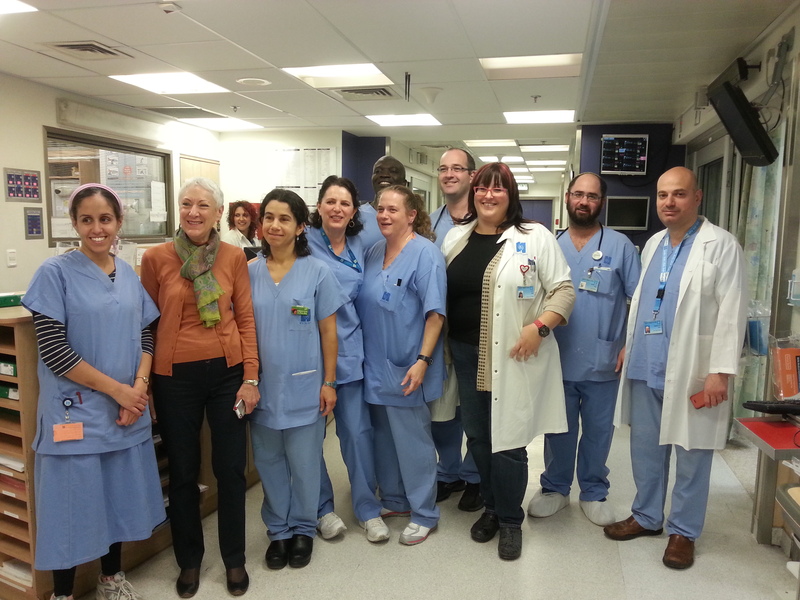 Hadassah National President Marcie Natan and Barbara Sofer, Israel Public Relations Director for Hadassah, visited victims of terror in the Hadassah Medical Center’s intensive care units and the Sarah Wetsman Davidson (SWD) Hospital Tower. Their first stop was Intensive Care Unit (ICU) A, in the Judy and Sidney Swartz Center for Emergency Medicine. Among the patients they greeted was Risa Rotman, a Canadian-born mother of ten, whose husband, Howie (Chaim Yechiel ben Malka), was still unconscious after being attacked by terrorists in the Har Nof synagogue. Risa does medical writing and Howie works in the State Controller’s office. It was their dream to live in Israel and bring up their children in Jerusalem. 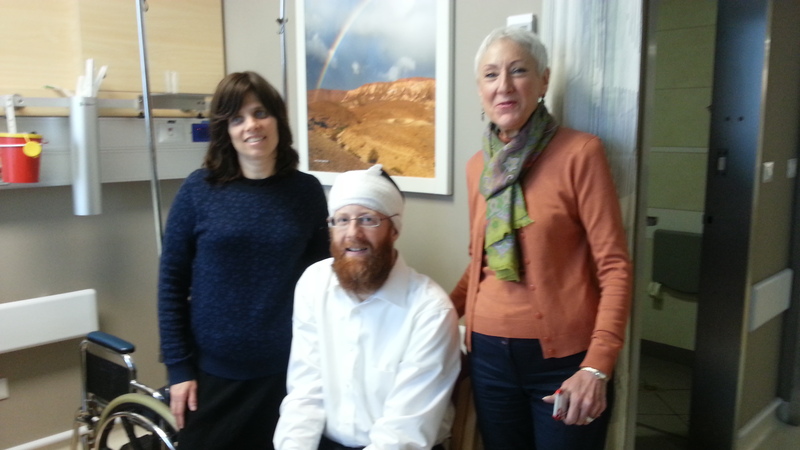 Mrs. Natan and Mrs. Sofer then went to visit patients in the Sarah Wetsman Davidson (SWD) Hospital Tower. They were happy to see that former ICU patient Moshe Yonaton Aharoni, who was gravely injured in the Gush Etzion vehicular attack, had been transferred to a room in the Tower. His mother, Yakira, is a nurse who underwent brain surgery earlier this year. She sent blessings to all of Hadassah’s supporters. Next, Mrs. Natan and Mrs. Sofer knocked on Shmuel Goldstein’s door. To their surprise and delight, Shmuel, who suffered multiple injuries while trying to subdue a terrorist, answered the door himself. 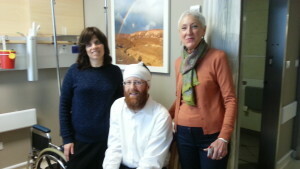 A bandage wrapped like a turban around his head, a black kippah perched on that, wearing borrowed glasses (his were broken in the tussle with the terrorist), he greeted them warmly and thanked them for coming. Miri, a nursery school teacher, says of her husband: “He’s so quiet and self-effacing, but when he had to protect himself and our son from the terrorist, he fought”! When Mrs. Natan knocked on Shmuel’s hospital door, he had been busy writing letters of thanks to Prof. Avi Rivkind, head of Hadassah’s Trauma Unit, who had treated him when he arrived and followed his case; to Neurosurgeon Guy Rosenthal;, to the orthopedists under the instruction of Prof. Rami Mosheiff, head of Orthopedic Trauma; to Dr. Yoram Weill, who took care of his shoulder; and to the plastic surgery team under Dr. Alex Margolis. “They were so able to focus on his injuries and help him get better,” said Miri. As much as they love the Tower, they were eager to get home to their nine children, including a two-year old.